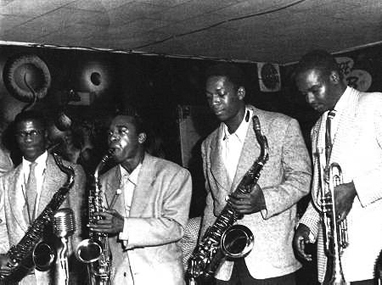 In the world of jazz, John Coltrane is viewed as a spiritually driven supremely gifted sax player, who is seen as one of the greatest horn players to ever live. 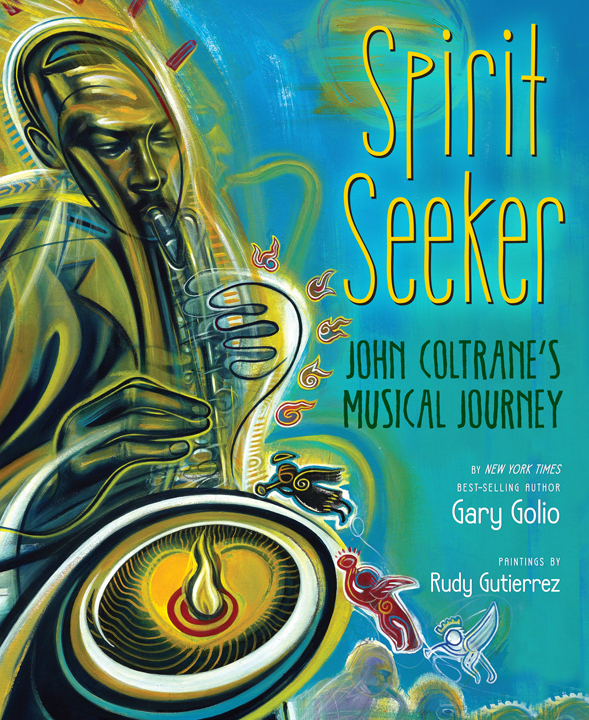 So when I ran into Gary Golio’s book “Spirit Seeker,” I was interested in seeing if he was trying to exploit our beloved St. John Coltrane or if he was trying to bring another generation into the knowledge of Coltrane’s legacy. He did the latter, masterfully. I had my 8-year-old daughter read it, and she gave it a passing grade, be it that she was interested in hearing Coltrane’s music afterward. “Spirit Seeker” is a beautifully illustrated, compelling story about one of the greats of Black music. This is important because we have to teach our children about jazz and Coltrane; very few school districts even attempt to. Check out author Gary Golio in his own words. M.O.I. JR: What inspired you to do a children’s book on John Coltrane? What does he mean to you? Why? GG: Coltrane – for me – is a great musical creator with a big heart. His playing and composing run the gamut from tender to swinging and from deep and soulful to spunky, wild and far out. He’s a bold explorer in the areas of both feeling and sound and an inspiring example of what an artist can be. I wanted to share that with kids, with a new generation of young listeners, to turn them on to this amazing man who had very human struggles and whose success was built on persistence, passion and the desire to do his best with what he’d been given. Kids need to be inspired! M.O.I. JR: The illustrations are beautiful. How did you find a good illustrator to illustrate your words in such a powerful way? GG: For picture books, the publisher chooses the artist, and the author usually has very little say in that. My editor, Lynne Polvino of Clarion (Houghton Mifflin Harcourt), saw Rudy Gutierrez’ work and thought he could do something visually amazing. She was right! Rudy’s done fantastic paintings of historical and musical personalities (http://www.rudygutierrez.net/) and even created the cover for Santana’s “Shaman” album. His work is an unusual balance of expressive and realistic imagery, symbology, swirling colors and emotional intensity. For “Spirit Seeker,” he changed his color schemes to suit the text on each page and was somehow able to work with both the darkness and the light, the sadness and the joy in Coltrane’s life story. I couldn’t have asked for a better partner in making this book all it could be, as a tribute to the greatness of John Coltrane. M.O.I.JR: What do you hope children take away from this book? GG: That everyone has their struggles and difficulties, that we all stumble and fall, and that we can each enjoy a measure of success or victory in our lives by working hard and staying true to what we believe. It’s easy to become discouraged by what we see and experience in this world, so we need to be reminded that others have gone before us and can show us the way. Coltrane’s story is really the hero’s journey, about someone who suffered a lot early on, but stayed on his path, taking one step after another. It’s no accident, I think, that the major album after his recovery from drug use was called “Giant Steps.” That wasn’t just about making musical strides, but personal ones, as well. As Trane said himself, it’s all about being the best you, whatever that might be. “Spirit Seeker” is a beautifully illustrated, compelling story about one of the greats of Black music. This is important because we have to teach our children about jazz and Coltrane; very few school districts even attempt to. M.O.I. JR: Why a children’s book and not a biography? GG: Far better writers than I have written great adult biographies about John Coltrane. Lewis Porter’s “John Coltrane: His Life and Music” immediately comes to mind, but there are many others. My interest – and perhaps my talent – lies in highlighting the important elements of Coltrane’s story that kids can relate to and simplifying the complex details of his life. Also, as an addiction therapist who specializes in working with young people, I wanted to tell a story about drug use from a very human point of view, to demystify some things by showing how drugs are only a side effect of what happens to someone in their life – the pain, the struggles, the conditions that shape us as children. Addiction is never about the drugs, but rather what someone is trying to do with them – to feel less sad, less angry, or to simply forget things that have happened. I have tremendous respect for people who recover and maintain their sobriety, because they’ve had to find other ways to manage painful feelings and memories, and that requires a lot of courage. M.O.I. JR: Who are some of the other subjects that you have written about? GG: My first book, “JIMI: Sounds Like a Rainbow,” was about the childhood and remarkable creativity of Jimi Hendrix, something that most people know nothing about. Jimi had a tough time growing up in inner-city Seattle, and it was his imagination that made it possible for him to survive and become the person who changed the sound of the electric guitar. My second book, “When Bob Met Woody: The Story of the Young Bob Dylan,” is about Bob’s childhood in the Midwest, leading up to his meeting with hero and mentor Woody Guthrie in 1961. It’s a story about personal heroes, and how kids – each of us – choose someone as our guiding star, to imitate and emulate. Bob stood on Woody’s shoulders and later changed the course of modern popular music. M.O.I. JR: How do people keep up with your work online? GG: I’m not exactly Justin Bieber (haha), but folks can visit my website (www.garygolio.com) or check out my Facebook author page (www.facebook.com/garygolio) to see what I’m up to. At my website, you can learn all about my childhood ability to catch spiders with my bare hands, and my desire to be a superhero – Spider Man, who else? – at an early age. There are separate pages for each of my books and links to reviews or interviews. And I always like to hear from readers, both young and old!